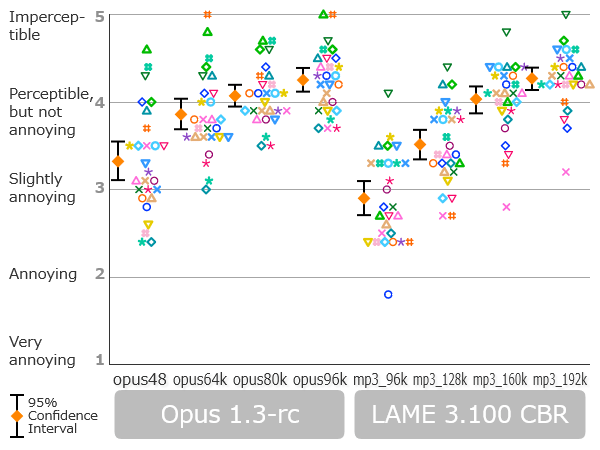 Blind sound quality comparison of MP3 and Opus. 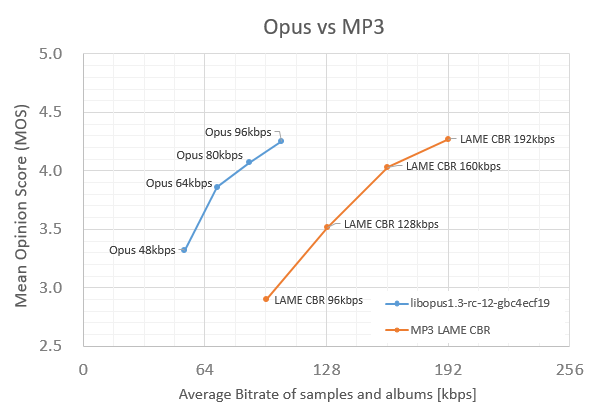 Opus was tested at half the bitrate of the MP3. 15 sound samples from Kamedo2's samples. 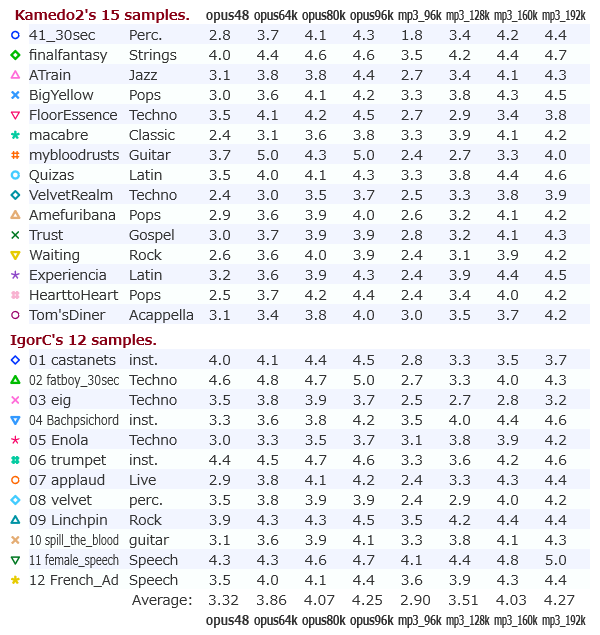 12 sound samples from IgorC's samples. The Opus at 64kbps setting sounds better than the MP3 at 128kbps. The Opus at 48kbps setting sounds better than the MP3 at 96kbps. The Opus is likely to be the first format which delivers the equivalent sound quality as MP3 at half the bitrates, not as a marketing plot but as a fact. The high efficiency of Opus is more pronounced at the lower rate. Interesting, but I wonder why you chose CBR, not VBR using lame. CBR was widely used in the past so it's a better anchor. Thank you for this very interesting test. I use Opus 96 kbps VBR converted by foobar2000. 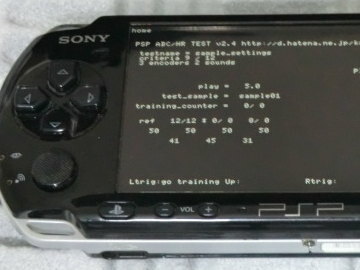 Wait there's abx homebrew for the psp? This makes me think about dusting off mine to use as a portable player instead of my phone. Can you add also opus at 32kbps? For other part the result is no surprise for me as 64kbps have been my selected bitrate to use on the go for music (phone, car...), I also use 32kbps for audiobooks and 48kbps for podcasts (latelly I even sometimes use 32kbps for podcasts). Actually 32kbps is more used that most people here can think, specially in places with data caps and/or low speeds. And I miss a more aggressive VBR mode for opus, more like a dual rate mode where one can specify different rates for music and voice. Are you really sure that 0.2GB of cost reduction is more important than improving his/her listening experience? From my very limited experience ;Optus 32 - very bad artifacts like no need to abx at all. Even at 64 I think i can still hear it but much better quality than 32. @ 96k I don't know. 64-128 kbit/s for FB stereo music. Music with Opus 1.3 at 32 kbps has too much noise and sibilance. Old samples of USAC from the original verification tests usually sound better to me than Opus 1.3 still. Below 64 kbps and especially below 48 kbps Opus loses more and more to certain higher latency codecs. For speech it is a different story though, 32 kbps is great and if limited to mono then even 16 kbps is good. I look forward to what can be done with LPCnet if the remaining issues can be addressed. Mono music has improved a lot too, incidental mono music is okay down to around 24 kbps now IMO. "more like" versus "PROPOSED STANDARD"s "these are the bitrate "sweet spots"" ? You are the speechwriter T.May? Why the hostility? That RFC is from seven years ago; since then there have been improvements to Opus especially with low bitrate speech. And those "sweet spots" are just someone's opinion. of course, but how much this "improvements" reduce the "comfortable" bitrate? 10% ? 30% ? or 2-5% ? where? love (ἕτερος) and peace (healthy). Very interesting test result, thanks for this!